I love to read my students' poems, and these interactives and poetry collections provide them inspiration and guidance. I've seen sparks of creativity fly for children and teens alike. The collections of poems include classic favorites as well as works by contemporary authors AND kids. And readers have added another dozen of their favorite websites to the readers' recommendations list at the end of this article. Although they are enthusiastic, my students sometimes find writing verse to be a challenge. They struggle with choosing just the right word. Or they are unsure if they had the right form. How do you write a haiku? How about an acrostic or a limerick? That's where these writing tools and examples help. Many of them have forms, tips and scaffolding. A few even give your kids the opportunity to submit their finished works of poetic art for online publication. Added bonus - many of the sites also have lesson plans for teachers. ReadWriteThink is one of the foremost websites in providing online reading and writing activities for students and lesson plan ideas for teachers. They have several interactives and an app kids can use to wax poetic. 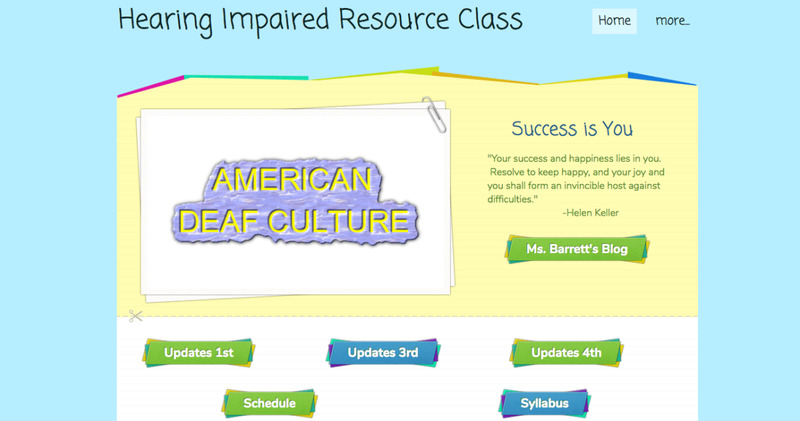 Each interactive is accompanied by lesson plan ideas for students at various grade levels. Be sure to print or copy each completed poetic masterpiece! They cannot be saved online. The interactives described below provide step-by-step instructions for creating word mover, acrostic, diamante, letter, riddle and shape writing poems. The Word Mover interactive and Word Mover app for iPad invite kids to verse by manipulating word tiles. 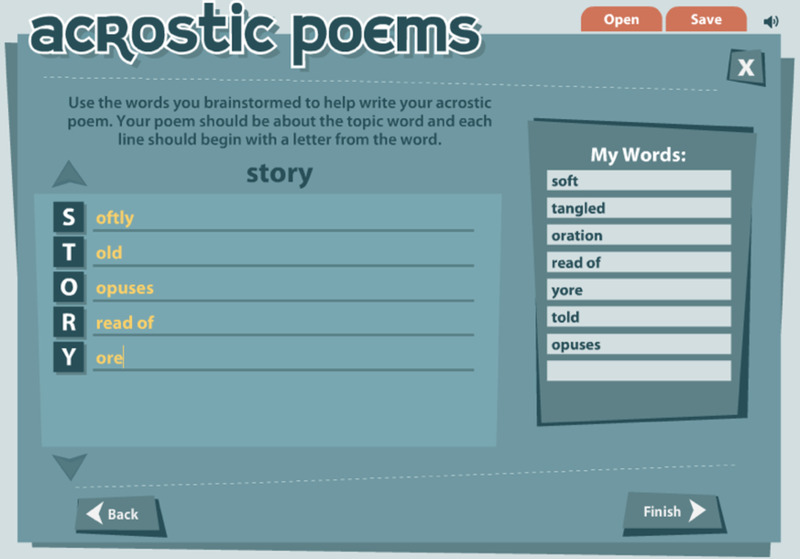 Students can add their own word tiles, choose backgrounds, and share their poems by email, Facebook, Twitter and more. The Acrostic Poem interactive provides a form where you pick your main word, then write words that start with the letters of the main word. After you brainstorm your acrostic words, you type in the ones that best describe your main word. The interactive will suggest other words when you point at a letter in the main word. You can then print your work or go back and make changes. 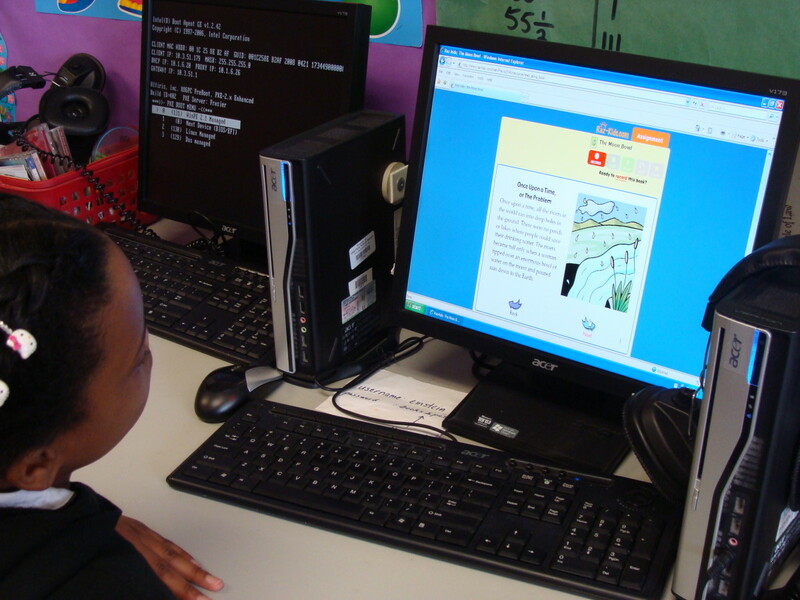 Using the Diamante Poem interactive, kids create verse in the shape of a diamond. They select a central theme, then use adjectives, -ing verbs, and nouns to "paint" the theme. The interactive has examples to guide the poet. There are also pop-ups on the fill-in-the-blank diamante form to help guide the student through the parts of speech that make up this form. Letter Poem Creator is designed for students in grades 3-5. Using the example in the interactive, students insert line breaks, thus turning narrative into verse. The model explains the process of breaking a letter into ideas, and stanzas. 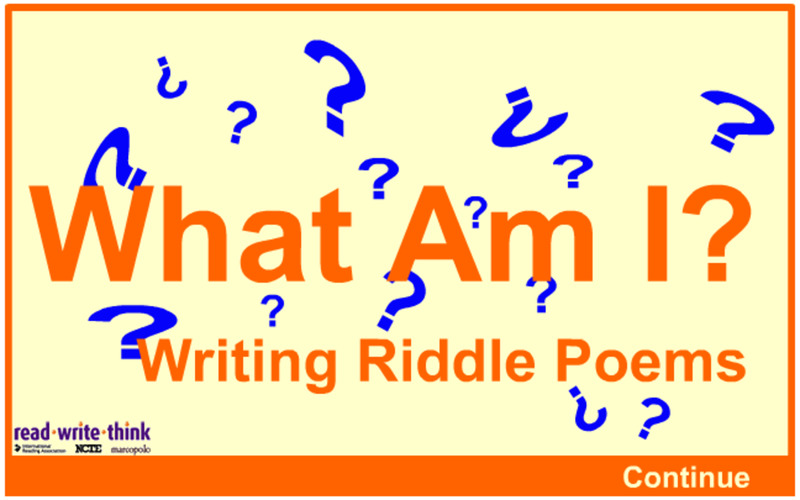 Middle school kids in grades 6-8 can "riddle me this" poetically. The Riddle Interactive helps students to make use of simile, metaphor and metonymy. Students design a riddle around an answer, such as a door or grass. They brainstorms words associated with the answer, their synonyms, antonyms. The best riddles use as many of the senses as possible. The Shape Theme Poems interactive was designed to help elementary students gel thoughts based on a theme in the shape of the theme-related object. This interactive tool provides 32 different shapes around such themes as sports, nature and school to spur creativity. 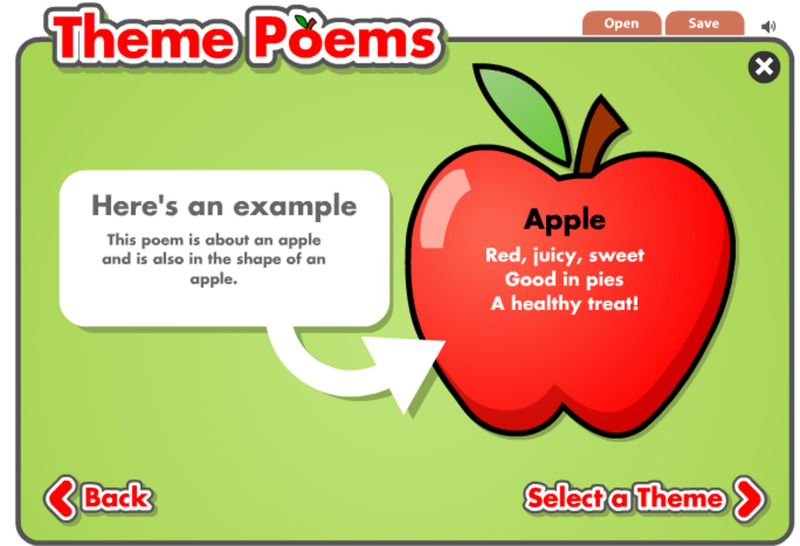 Shape Theme Poems is now also available as a free app for iPad, iPhone and Android. 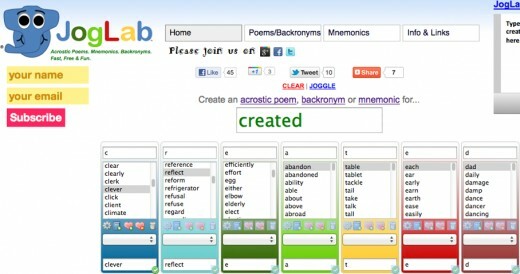 JogLab's Word Finder is a great tool to jog kids' memories for associated words to use in specific types of poems. The poems emphasized on this site include acrostics, mnemonics, and backronyms. What's a backronym? JogLab explains all. The site is loaded with examples for students to riff on. From the list of words "joggled", kids can order them by noun, verb, adjective, etc. Then they select words for their hot list of favorites for the poem they are creating. It's best suited for students in grades 3-12. See the demo in the video below. Other resources on this site include the works of Shakespeare, Mother Goose poems, a poetry forum, and several vocabulary games - lots of goodies for young and old poetry lovers. Poetry 180 provides schools, classrooms, and homeschooled teens an opportunity to listen to poems by popular contemporary poets. Designed for pure enjoyment - there's no need to analyze or write about the poems. One a day is typically read as part of morning or afternoon announcements. Each poem is accompanied by a brief bio of the author, background of the poem, and a link to more detailed information about the author's work. Billy Collins, U.S. 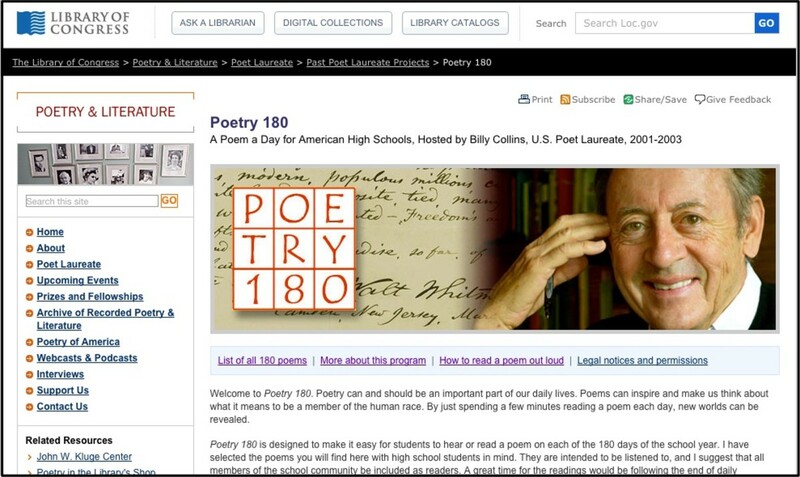 Poet Laureate, 2001-2003, is the host of this series that resides on the Library of Congress website. He provides guidance on how to use the poems, and an example of how to read one that is particularly helpful. Spend some time with writers of children's poetry at Scholastic's Writing with Writers: Poetry. Three well-known poets discuss samples of their work, and give kids advice on their own poetry writing. You'll also find guidance for publishing your kids' poems in the lesson planning resources for teachers and homeschool parents. Watch Jack Prelutsky, Children's Poet Laureate, as he waxes poetic with a selection of his works. 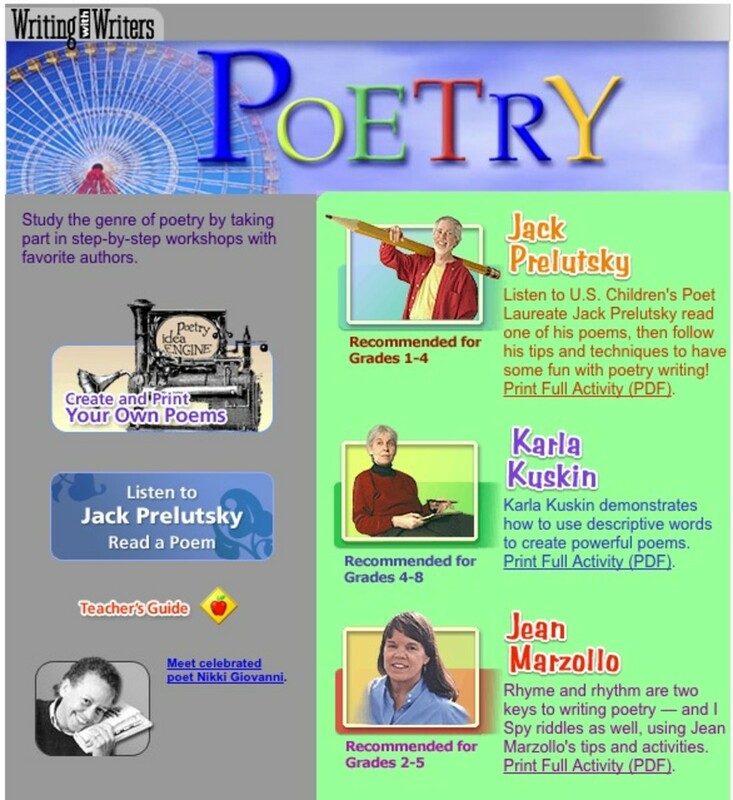 Karla Kushin offers kids in grades 4-89 her poetry writing and revising tips. Jean Marzollo, the writer of the well-known I Spy riddles, offers guidance and tips to kids on creating their own "I Spy" riddles. And K-12 students have the opportunity to publish their poems to this site. Try the interactive Poetry Idea Engine to create and print a limerick, haiku, cinquain or free verse. Time for a poem . 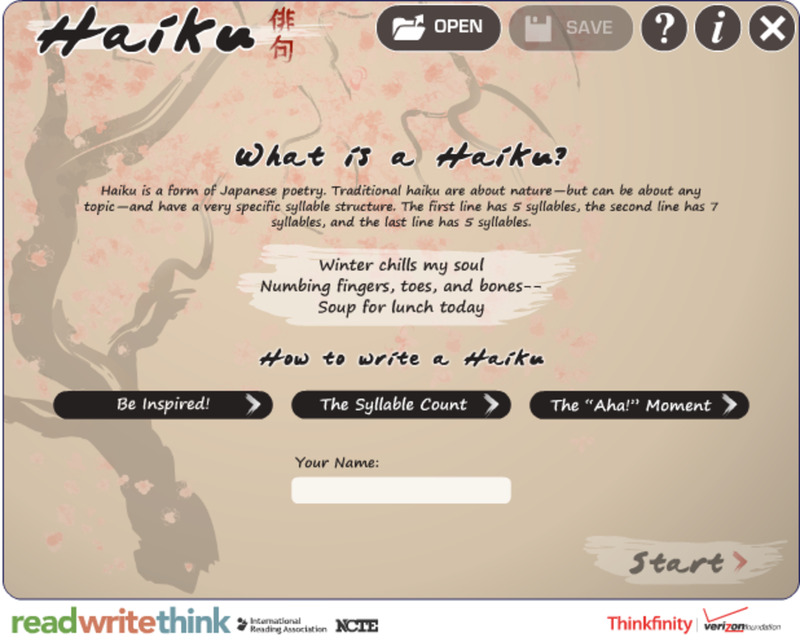 . .
Haiku Poem Interactive is a relatively new addition to the ReadWriteThink family of student interactives. It explains the 5-7-5 syllable pattern, the significance of an "Aha!" moment, and offers suggestions for getting inspired. Students brainstorm a list of eight words and their syllable counts, then use those words as a kicking off point for their poem. The interactive does not hold them to the strict 5-7-5 pattern. Once a child completes her poem, she can change of the font style, background image, and position of the poem and the page to get the effect she wants. Poems can be printed or saved for later use. 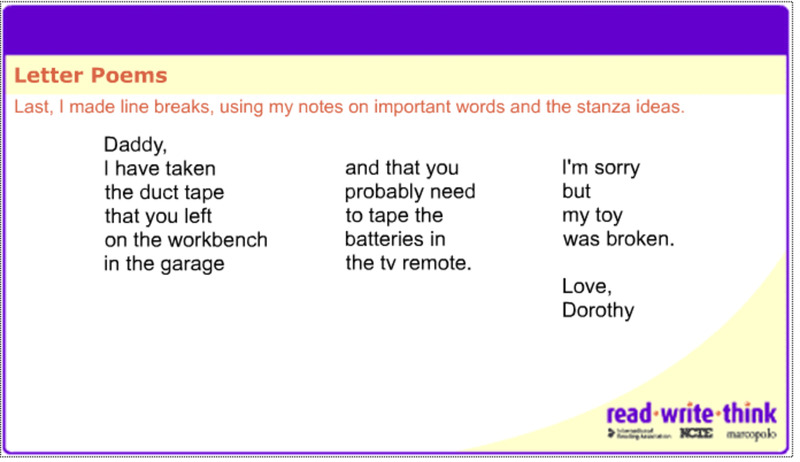 As with their other materials, ReadWriteThink includes lessons plans that make use of the interactive. 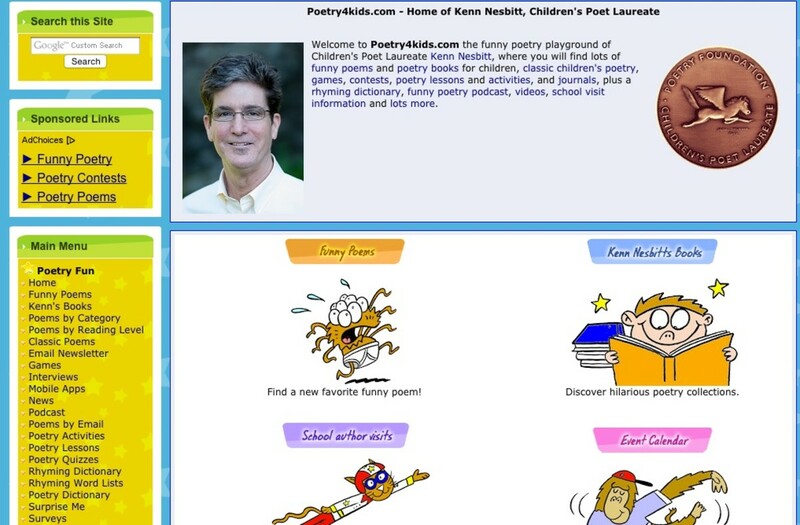 Poetry4Kids.com is home to the works of Ken Nesbitt, Children's Poet Laureate, and it is a poetry playground. 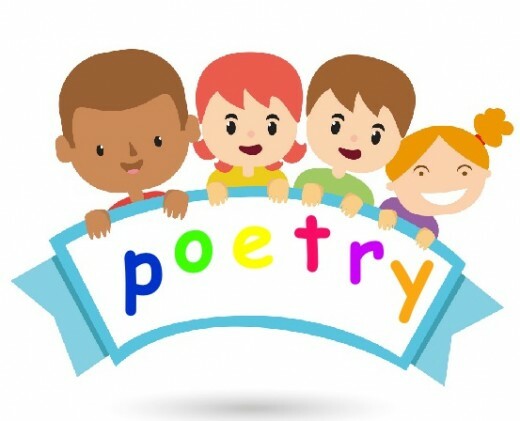 Kids read and rate the poems on this website. You'll see funny ones, the newest ones and the most popular ones. There are lessons on writing funny poems, including clerihews and exaggeration poems. And there's a simple rhyming dictionary. If you register (for free), you can enter poetry contests, participate in a poetry forum, and even keep a poetry journal. In these activities geared to students in grades 6-12, Curriculum Pathways Poetry Resources provides lessons to engage students in analyzing different types of poetry. Students learn poetry-reading strategies on themes in nature, sports, families, and the great poems of English literature. Teachers can adjust the lessons to meet the needs of the students. Free registration is required for teachers and students. This is also an excellent resource for homeschoolers. Get some inspiration for a video creation from the beautiful selection on the Poetry Foundation website. 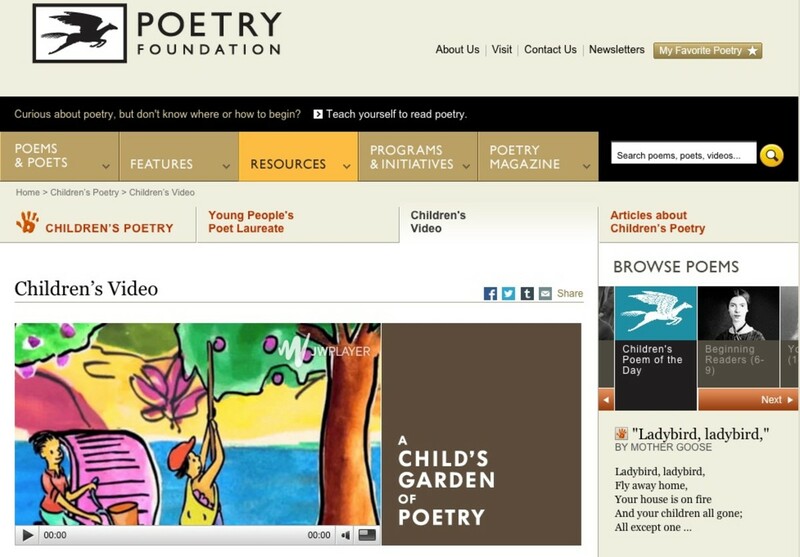 In addition to the video collection, there are interviews with well-known poets, including the Children's Poet Laureate. Among their other resources is a Poetry Tool, where you can browse through a selection by age group or category. Teachers and homeschooling parents will find lesson plan ideas in their Learning Lab resources. Take your poetry on the go, with their Poetry apps for iPhone, iPad, and Android devices. 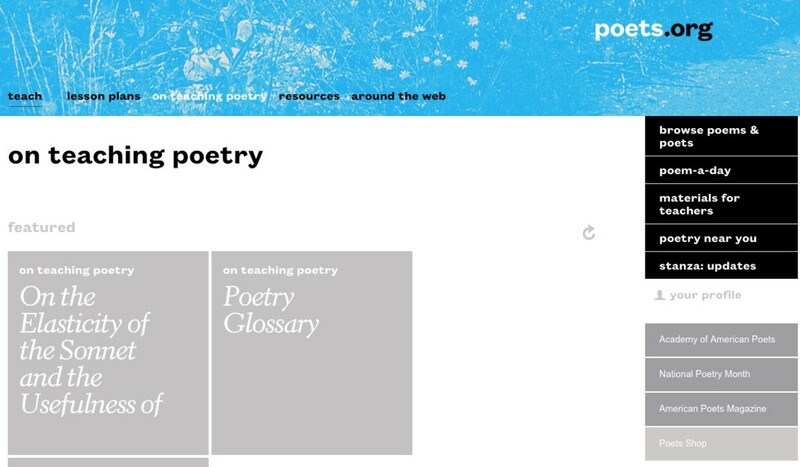 Browse by category, or search by poet or a line of poetry. Or give your device a shake to discover a random new poem. Teen Ink offers teenagers a forum and showplace for the poetic works they write. Teens submit their original works and their peers vote on those they like most. 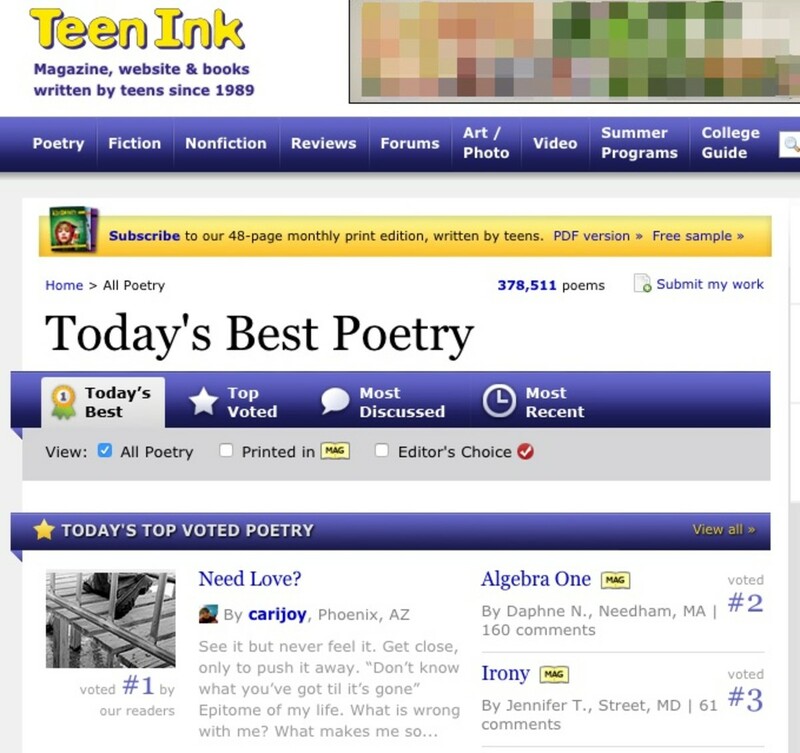 The most popular poems posted by teens are showcased on Teen Ink. There's a forum for teens to get feedback on their poetry and share their ideas. And Teen Ink offers similar opportunities for teens who write fiction and non-fiction stories. 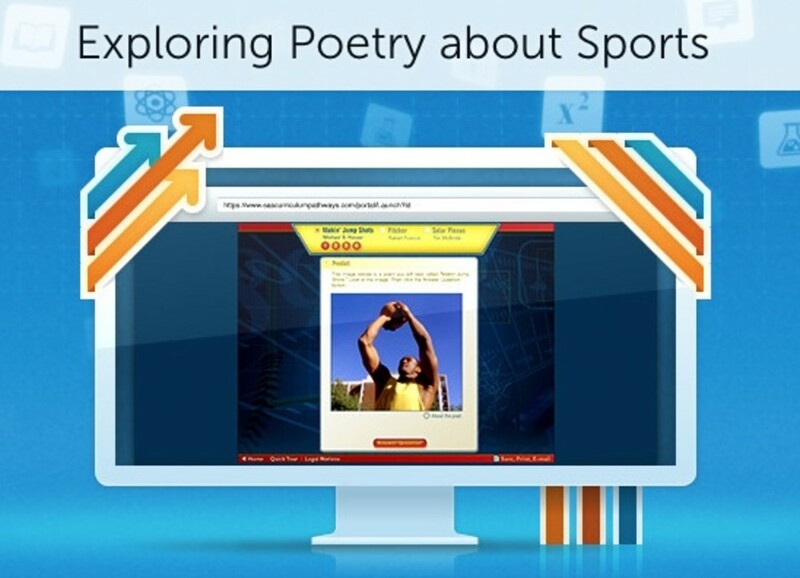 Poets.org has extensive educational resources for high school teachers to use with students. There are curriculum and lesson plan ideas, a teacher discussion forum, essays and tips on teaching poetry. There is also an anthology of poems to share with students. Have you tried writing poetry using interactive poetry sites? - Or do you teach with them? amazing thank you and very informative! The interactives and apps described above on ReadWriteThink (#1 on the list) are games that provide scaffolding for kids writing poetry. Poetry Splatter (#7 on the list) does much the same. My students have particularly enjoyed ReadWriteThink's haiku interactive. are their games on this website ? 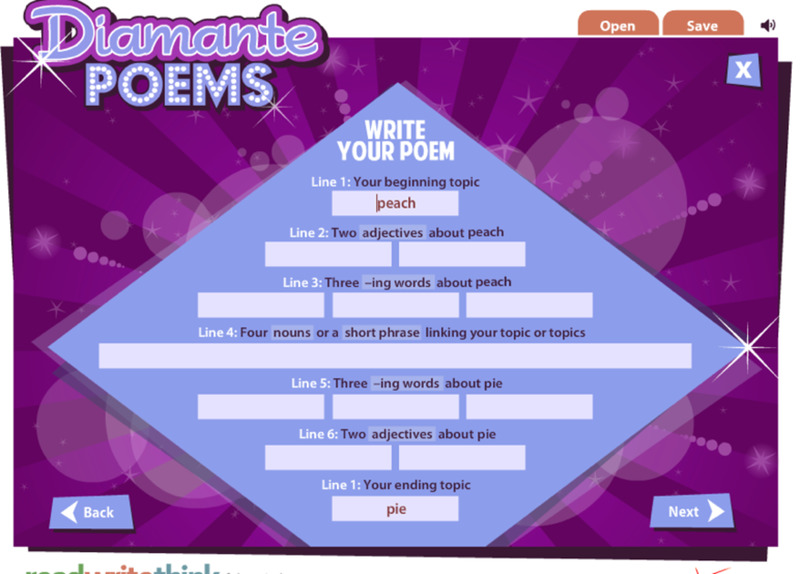 I hope this site might become a fun and educational resource for kids who want to compose their own poems. If you have a spare minute, please, check it out. 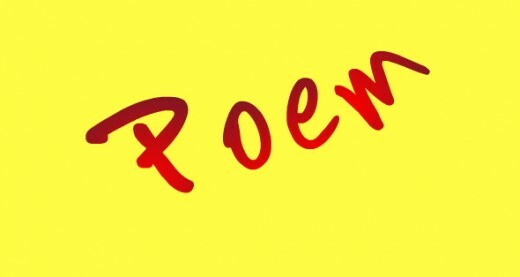 lravidlearner, this is an excellent collection of poetry websites for children! Your little write up on each gives a good idea of how each differs from the other. Thanks for sharing these resources. I love reading and writing poems. Thank you for sharing this extensive an very useful list. Great lens and thumbs up. I have not yet used interactive sites for poetry. Actually, I write poems while writing in my journal. They just appear while I'm lost in the space of free thinking. I suspect that children find it easier to write poetry than adults because they (children) don't know they can't. Thanks for all the info on poetry sites. It will come in handy for homeschooling next year. I have never tried interactive sites to write my poetry. So funny cause I didn't even know they existed. Wow I will have to check them out. I so appreciate your lens most especially directed towards children writing poetry. It is such a blessing to the human spirit to do anything creative. Thanks for these great resources for Poetry Month! Wow, another great resource! I love poetry and can still remember poems I memorized as a kid. I only wish I was better at writing them. Thanks for all the legwork. Poetry for children, I love it! no but i'm so glad to have this resource available. i just write poetry on paper. I read this lens just to make sure Shel Silverstein was here. He was a big part of my childhood, and I remember being really sad when I heard he had passed. Returning with fresh angel dust for this 2010 LotD winning resource. Have not tried either, but thanks to your wonderful lens I am going to try it! Thank you so much for sharing, lovely idea and excellent post. So fun! 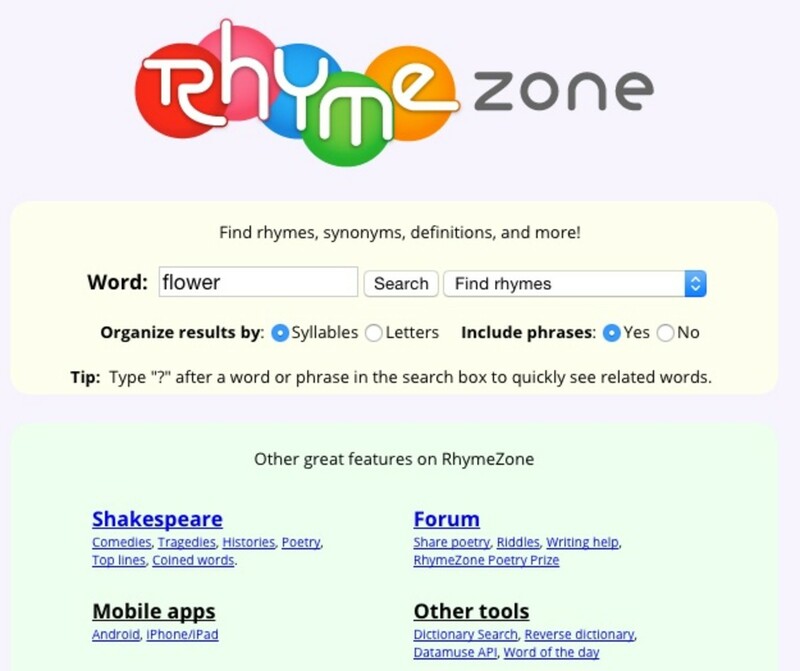 Love the Rhymezone Dictionary and what IS one dentist more or less?! Great resource. I'm a homeschooling mom working on writing poetry right now. Will definitely be referring to the sites on this list. Liked and shared! I've been a "techy" writing teacher for 3 years--how did I not know about all these cool sites?! Thanks so much for the education. :) I just featured your lens on my "The Best Summer Learning Activities and Projects by Subject" lens. Great topic! Whatever helps fuel interests in literature and literacy in kids is something we should promote at all costs. Great lense! I'll be back later to access some of the resources you suggested. Is poetry a way of story telling for kids--poetry out loud ? Congrads on your Squidoo level 56. Am going for next level. Will visit again soon. Thanks. But I hope to adapt some of these on paper. Well I've tried writing poetry so much! And I'm good at it :-). My friends and my teachers appreciate my poetry. Great Topic and strategies! Thank you! I have not.. but this is an excellent poetry for kids page! This is just beautiful lens and a very good topic. If only my 9 year old daughter knew English more than she does :) Blessed by a SquidAngel! Love the rosen poetry, just fantastic. I also write children's poetry, but do not dare to publish them. 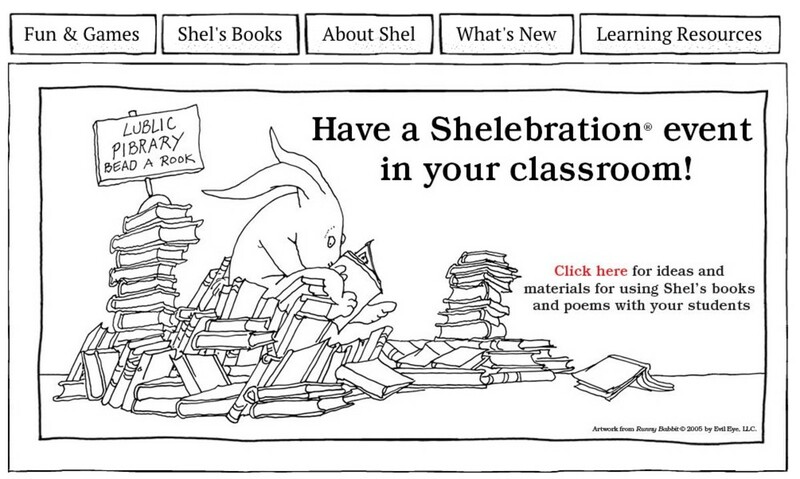 I didn't even know there were poetry websites for kids...how cool! These are some great links. I've been searching for poetry related stuff for years and haven't seen some of these. Great job. I just learned about this lens. There is a lot of information here but I love your basic premise on inspiring kids to write poetry. I just did a lens on my shortend version of favorite poets. I write a few poems frm time to time. But they come from within me and inspired by a vast amount of knowledge I have accumulated from reading poetry of those who inspire me. SO that tehcnique may be good fit for some kids, ie, be inspired by those few you learn to admire. Focus on emotion and person rather than be driven by technique. Topic 02: Poetry reading loud is an art that we have lost in America for some reason. We need to inspire kids to be great poetry dramatists like those who exist in the Russian Culture and French Culture for example. So is poetry recitation is worthwhile topic with support from not only teachers but also community ? THis can be done easy enough once a decision is made, that yes, poetry reading out loud is a valueable skill, not only for poets but also for those who go into theater and drama, reading other people's poems, perhaps a fellow student, or from a poet one admires from history. Comments ? I haven't written poems for a while now...will definitely brush up on my poetry writing skills!! 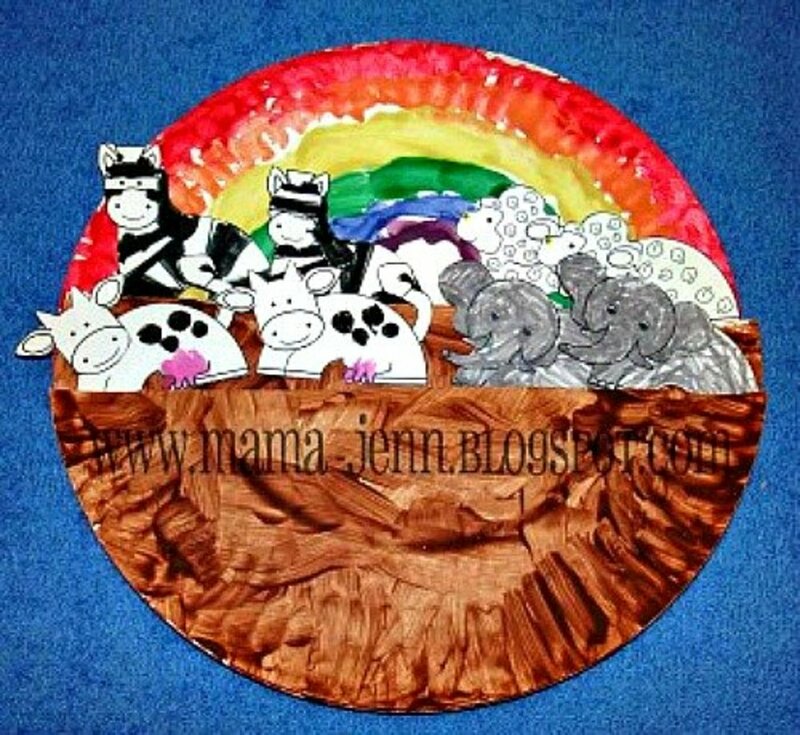 I went through this with my son and participated in some of the posted activities. Awesome lens! 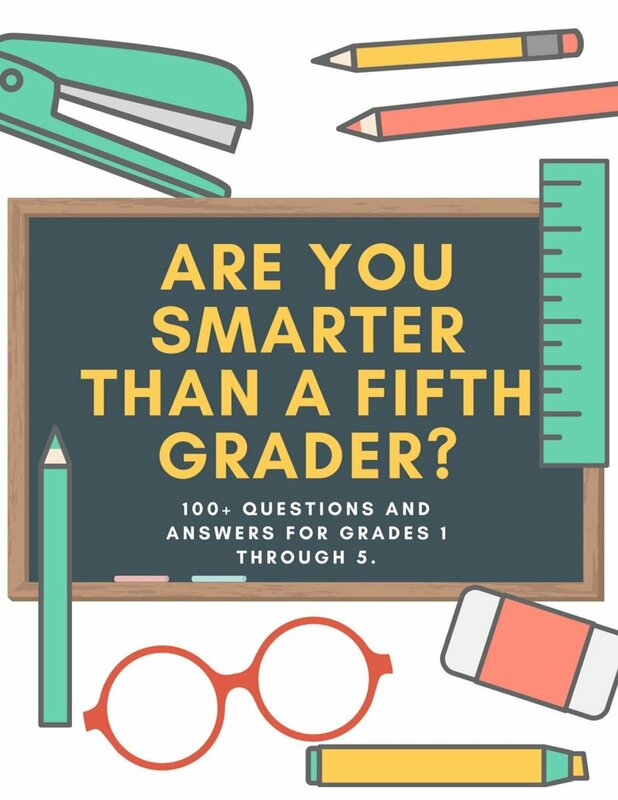 No, I haven't but this is a great resources for anyone and especially kids. Wonderful and blessed. No, I haven't, but I can see that these would be very useful indeed! Love the crocodile toothache video! Cool resource! I have been to the Shel Silverstein one. It's cool! Blessed by the poetry angel! Poetry is wonderful vehicle of expression!! You have such a wonderful list of resources here, I just emailed a link to this lens to all my former kindergarten teaching colleagues. Thanks for sharing. What a great resource for teaching kids about poetry! I love poetry and so do my daughters. Great lens! Nice educational information for kids. Well done. My nine year old son shows some talent with writing poetry and likes to read funny poetry. He has two younger siblings. We haven't found the time to explore poetry writing like we should. I think he'd love it and be good at it. I voted for one site, Welcome to PS4K. Kid poems and stories can be submitted and voted on. I added your plexo to my recent LOTD lens, Reading Starts at Home. I hope more people vote and check out your sites. I haven't even touched the surface of the valuable information you've shared on this lens. My son and I will be back! I will make it a point to visit these gorgeous websites, they are good even for grownups. Thumbs up. I wish that teachers in years past would have made learning fun as you are showing on your lens. I was brought up with the recite, recite, recite and it wasn't until I was out of school that I started to appreciate poetry. Shel Silverstein is one of my favorites. My kids and grandkids love poetry because they grew up with it. I really enjoyed this lens. Super lens. I love Shel Silverstein. Then again, who doesn't? Thanks for the great links. Great lens...I just put together one about Shel Silverstein the other day! Not yet, but will check them out. Amazing lens! 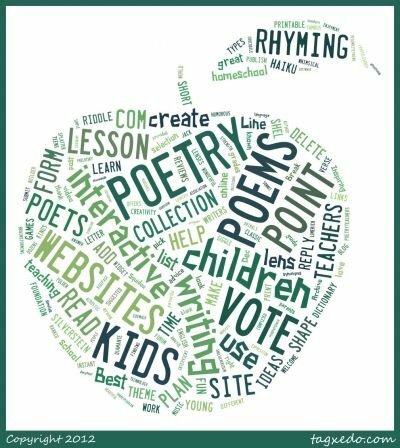 Many great resources about poetry for kids. Thans for sharing. Great Job on your lens ! Now I know where to look when my kid needs another poem to recite in school ! I have never really tried wiring poetry using interactive sites. I could give it a try though. This lens convinced me. What a fabulous resource. I'll be coming back here again for sure! Congratulations on LotD. Very innovative lens for all poetry lovers.I like poetry.You have provided lots of interesting sites to keep in touch with poetry. Why not poetry have them clutch? What a wonderful lens to visit and find resources for children. Congratulations on LOTD! I've used the instant poetry forms and it's very gratifying to see the results. Great topic. I'll tell my friends with children about it. These look fun! I'll try them out with the children. Thank you and congratulations on LOTD! My son loves poetry, and he's quite the rhyming poet already. Thanks for this useful lens of poetry sites. Congrats on LotD! Congratulations on lens of the day. I love the riddle poems. I remember them from when I was a kid. Fun Lens! Now we're looking at poetry in a brand new way. So by a Squid Angel you've been blessed! Anything that gets kids writing, reading and being creative gets high marks from me. One of the most popular sections on my web sites is the "shape papers with lines" section. My daughter loved Shel Silverstein - me, I'm a spoken word groupie from Cambridge/Boston ... I love poetry, performance or written. No, I cannot say that I have, but have written hundreds of poems - usually, unintentionally. Once you get started, it is hard to stop. Some of my grandchildren will love this! Terrific job! Great lens - I love the giggle poetry from Meadowbrook (I actually applied for a job there out of collage, but alas no luck :) ) and thanks for submitting some lenses to Review Central - I'll certainly add a category for educational kids site reviews. These sites look great. This is a wonderful gathering of resources. Thank you for your testimony on In2Books on my Mentoring Children lens Last year was my first year with In2Books and I'm looking forward to this years pen pal. Thanks to poetry I have found a use for the dangling modifyer. My step-son needed help with a Haiku recently. His teacher had given the wrong formula in the homework instructions, but we found help online. Excellent resource... Squid Angel Blessed. what a nice lens! As a future teacher, I think this is so useful! 5* from me! that was my poem! i hope u liked it! Great resouce. I will be teaching poetry in the Spring and I will definitely use some of your links. What a brilliant resource - my daughter likes to write poems. Thank you! We will be back! I am a huge Shel Silverstein fan, I have owned 4 of his books since I was very little, and enjoy them very very much. Welcome to the Poetry Poetry Poetry group.